This page contains Stars at Yerkes News items from 2010. To find recent news, visit our News page. You can find 2011 News here. Stars at Yerkes teacher Sherry Shelley led a team of eighth graders and a team of high school students to West Virginia University to participate at Capstone. Capstone is a three day event that is hosted by the Pulsar Search Collaboratory (PSC) Project and funded by National Science Foundation and West Virginia University. The students have to analyze 50 pointings to qualify to attend Capstone. They arrange their data in a scientific poster to take to Capstone. 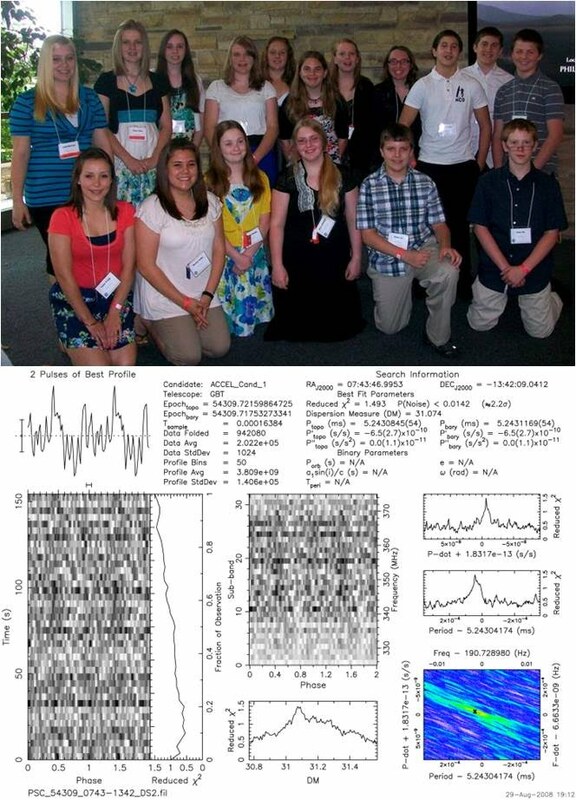 At Capstone, the students discuss their findings with student teams from other states and radio astronomers. Afterwards, the students take a tour of the university and attend social activities. This was Wilmington's second year of student attendance at Capstone. "It was so awesome to see my students soak up the experience of participating in real science research," said teacher mentor Sherry Shelley. She explained further, "They meet other students from other states such as West Virginia, Virginia, Ohio, and Delaware. They discuss astrophysics with leading radio astronomers, Dr. Duncan Lorimer and Dr. Maura McLaughlin. But, the best part for me as a teacher, is to see my students discover how much fun learning can be. Even though the my two teams were tired at the end of the trip, they made arrangements to share their experience with the Wilmington School Board. How utterly awesome is that!". What an outstanding and dedicated group of educators and leaders for astronomy education from around the world! June 2, 2011 - ARCS teacher Peggy Piper flew on NASA's new airborne observatory, the Stratospheric Observatory for Infrared Astronomy (SOFIA). Teachers can fly with SOFIA as part of its Airborne Astronomy Ambassadors program. You can watch Peggy's video on YouTube under http://youtu.be/prMLwi6x9y0. Sign up for the Stratospheric Observatory for Infrared Astronomy newsletter. Keep up with the news about the teachers who will fly on SOFIA during the pilot phase of SOFIA Airborne Astronomy Ambassadors (AAA) during the summer of 2011. Watch for the application to fly with SOFIA in 2012. The now outdated application for summer 2011 is linked here, because it has a wonderful summary of the program. April 16, 2011 - At the latest Stars at Yerkes workshop, teachers developed a new construct of knowledge as they built telescopes, explored online image processing, and tried out hands-on student lessons using learning stations. Josh Haislip from the University of North Carolina highlighted his work with Skynet and the automation of the Yerkes 41 inch telescope. Click here for lessons and more information. 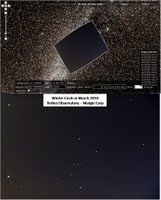 March 19, 2011 - On a recent trip to the delightful dark skies of southeastern Illinois, Stars at Yerkes teachers were challenged to uncover the meaning of asteroid light data collected by the Astronomical Research Institute. ARI Director Bob Holmes hosted and inspired the group, providing a tour of the facilities and providing access to a rich library of data on asteroids imaged at ARI. Tyler Linder and Dr. Jim Conwell of Eastern Illinois University added to this wealth of information, teaching about how the data is analyzed by constructing light curves. ARCS teacher Kathleen Roper organized the day to include a session on building devices to simulate asteroid motions, led by ARCS teacher Kevin McCarron. Click here to read more and access lessons. February 19, 2011 - Teachers were challenged to view their world in a new light at this month's Stars at Yerkes workshop. ARCS teacher Kathy Schmidt organized a rich agenda of topics and expert presenters highlighting the SOFIA Project and building infrared filter adapters for simple digital cameras. The day also included learning about how the radio frequencies of Earth help us find the distances to pulsars. Click here to learn more and access lessons and more. January 22, 2011 - ARCS teacher Kevin McCarron leads the first Stars at Yerkes book discussion with the topic of the demise of Pluto as a planet and the discovery of dwarf and minor planets. How I Killed Pluto and Why It Had It Coming by Mike Brown was the featured selection discussed in the morning session of this workshop. Afternoon topics included viewing Yerkes blink comparator and further development of the use of the Stone Edge Observatory.